The event will be held in the Cape Town International Convention Centre (CTICC), opened in 2004, which offers superb facilities and state of the art technologies, comparable to the best in the world. 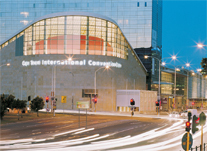 The CTICC is located between the city centre and the Victoria and Alfred Waterfront, right in the midst of hotels, restaurants, entertainment, and shopping. Have a look at the accommodation we have selected for you nerby.